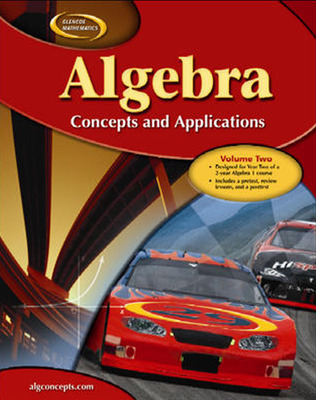 Algebra: Concepts & Applications is a comprehensive Algebra 1 program that is available in full and two-volume editions. Algebra: Concepts & Applications uses a clean lesson design with many detailed examples and straightforward narration that make Algebra 1 topics inviting and Algebra 1 content understandable! Designed for students who are challenged by high school mathematics, the 2007 edition has many new features and support components. Foldables are added to the beginning of the chapters for a unique way to enhance students study skills. Foldables ™ are added to the beginning of the chapters for a unique way to enhance students’ study skills.